Israel is set to release 550 Palestinian prisoners Sunday evening as part of the second and final phase of the agreement which secured IDF soldier Gilad Shalit’s release from Hamas captivity. The prisoners, who will be released to the West Bank, Gaza and Jordan, will join the 447 Palestinians who were released as part of the deal’s first phase in mid-October. Meanwhile, IDF forces and some 400 relatives of Palestinian prisoners included in the deal were clashing at the Beitunia checkpoint, near Ofer Prison, Sunday evening. The IDF Spokesperson’s Unit reported that a soldier was lightly injured from a stone. The relatives of the Palestinian prisoners, who also hurled Molotov cocktails at soldiers, gathered at the scene to welcome the prisoners but were asked to evacuate the area. 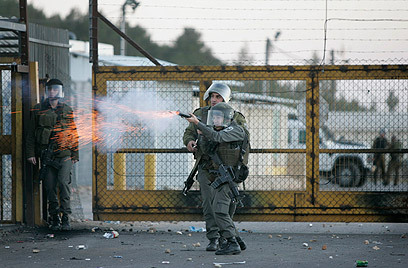 Firebombs and rocks were thrown at the soldiers during the ensuing clashes, the army said. The Palestinians also set tires on fire. Soldiers responded by firing gas canisters at the rioters. Earlier, the High Court of Justice rejected a petition filed by the Almagor Terror Victims Association against the release of the Palestinian prisoners, effectively green-lighting the second phase of the deal. On Sunday President Shimon Peres signed clemency orders for 43 security prisoners slated to be released as part of the deal. The release of the prisoners began at 7 pm, when 45 of the inmates were transported from Ayalon Prison to the Allenby, Atarot and Kerem Shalom border crossings. At 10 pm the remaining prisoners are scheduled to be transported from Ofer Prison to the Beitunia checkpoint. However, the group of prisoners who are set to be released does include Salah Hamouri, who plotted to murder Rabba Ovadia Yosef, and Taltal Na’asan, a senior Force 17 member who was arrested in 2001 and confessed to taking part in shooting attacks and planning to plant bombs in the Ramallah region. Another prisoner who took part in deadly terror activity and will be released nonetheless is Darwis Dadar, a Tanzim operative who was arrested in 2004. He was involved in a suicide bombing on King George Street in Jerusalem in 2002. the attack claimed the lives of three Israelis. Jaber Badr, a member of the Popular Front for the Liberation of Palestine who planned to carry out a suicide attack against Israel in 2007 as revenge for Israel’s policies regarding the Temple Mount, will also be released.